The etchings included in Le Magnificenze di Roma Antica e Moderna were clearly aimed at showing the monuments of Rome. Vasi, who regarded himself primarily as an architect, was attracted by the churches and the palaces of the Eternal City. His customers however and in particular his foreign customers were also fascinated by scenes of Roman life. In the early XVIIth century a certain number of Flemish and Dutch painters settled in Rome and they specialized in small canvasses portraying scenes set in taverns. The paintings were shipped home and had a large market there. The Italian painters used to call their foreign colleagues Bamboccianti (makers of rag-dolls) after the small and sketchy figures of their paintings. But in the second half of the XVIIIth century there was a significant decline in commissions from the Church and gradually the Italian artists paid more attention to a market demand they had insofar disdained. This page shows details of etchings in which Vasi portrays scenes of how the Romans spent their free time. In the XVIIIth century the Roman upper classes followed the French fashion and danced delicate minuets, while the lower classes remained faithful to the local saltarello (=little jump) a more lively dance marked by a tambourine. A famous example of saltarello can be found in Mendelssohn's Italian Symphony. Vasi shows a picnic at its last stages: the participants seem in the process of singing a hymn to wine, a reminder of the celebrations which the ancient Romans held in honour of Bacchus. The Dutch artists in Rome were known for their drinking habits. They formed a brotherhood called Bentvueghels (band birds) with an elaborate rite of admission based on a long series of toasts. As the rite was celebrated by a Veldpaap, who mocked the pope, they preferred to meet at inns outside Rome to avoid being arrested by the papal police for improper behaviour. The inn at Ponte Nomentano was a very frequent venue for their meetings. Santa Sabina on the Aventine hill was a very secluded spot and bowls players were not disturbed by carriages and riders. 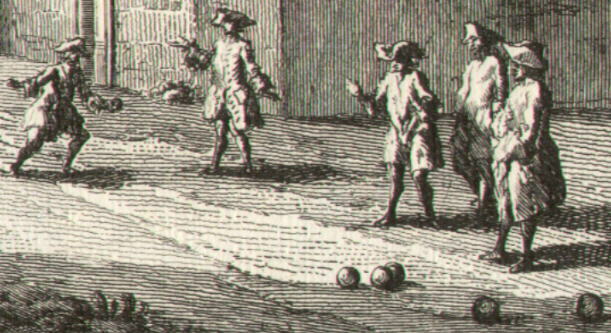 Vasi shows the player in the act of throwing the bowl with force to hit and send away the opponent's bowl. The game is still popular in Italy, chiefly in small towns. The peasants who came to Rome to sell their goods or to buy something at one of its markets were the target of quacks and charlatans who sold them elixirs to prolong life or to induce girls to fall in love. The peasants were entertained by actors impersonating the stock characters of the Italian commedia dell'arte, an improvised popular comedy. Famous Italian operas are based on these aspects of life (L'elisir d'amore by Donizetti and Pagliacci by Leoncavallo among others). Via del Corso was the setting for the Roman Carnival and windows and balconies were rented out at a very high price, especially to watch the horse races. But also during the rest of the year the ladies spent some time watching the people in the street. 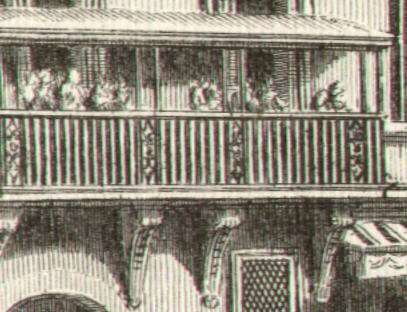 In some cases to allow the viewers to see without being seen, the balconies were closed by shutters with louvers. The religious rites were always very spectacular: the processions of the Holy Week attracted large crowds and occasionally the people attending them became so excited that they ended by attacking the Jews in the Ghetto. Vasi shows a brotherhood procession going towards the rear entrance of S. Giovanni in Laterano. During the Renaissance the popes were the promoters of entertainments and feasts, but in the XVIIIth century a greater consciousness of the religious role of the pope led to a more severe lifestyle. See also Traffic in XVIIIth century Rome and Trade in XVIIIth century Rome.